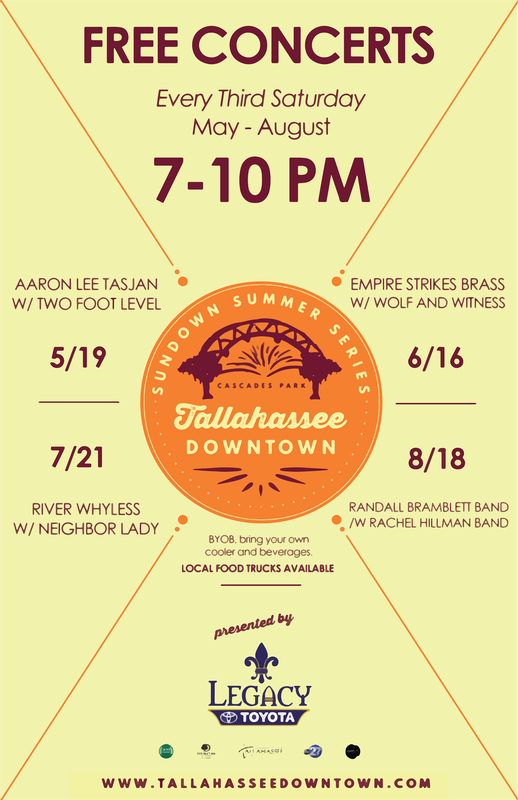 Legacy Toyota is pleased to present the Tallahassee Downtown 2018 Sundown Summer Concert Series at Cascades Park. The event is a series of FREE public concerts held on the third Saturday of May, June, July and August from 7-10pm at Capital City Amphitheatre at Cascades Park. We have a fantastic lineup of local and regional performers covering a diverse range of music from Funk and Blues to Rock and Americana. There will be a Fun4Tally Kids Zone with tons of family friendly activities, local food vendors, as well as the amazing amenities that Cascades Park has to offer including miles of trails, Discovery playground and the Imagination Fountain. We will SEE YOU AT SUNDOWN!